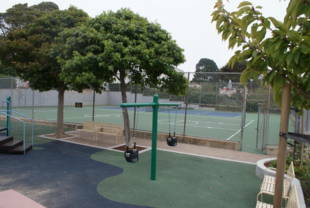 Junipero Serra Playground has a sandy kids' lot with a play structure, as well as nearby basketball and tennis courts, and a baseball field. Tiny Tots and Kids Gym are offered for children 1-to-5 years. Call 415.337.4713 for schedule. 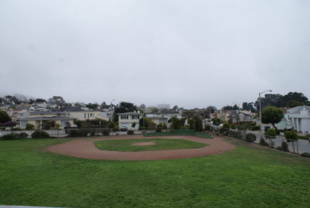 Junipero Serra Playground is owned by the San Francisco Recreation and Park Department. Exit at Stonestown Galleria, cross 19th along Winston Dr., then walk south on Stonecrest Dr.
January 18, 1955 was a good day for kids in the Lakeside District. Their first playground opened when Mayor Elmer Robinson completed the dedication. 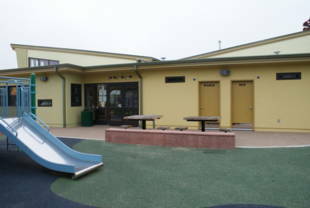 Set in the area bordered by 19th Avenue and Junipero Serra and Sloat Boulevards, Junipero Serra Playground was financed by the 1947 Recreation Bond Fund. The one- and-a-half-acre triangular plot, bought from the Stonecrest Corporation, was fitted out with a baseball field, tennis court, basketball court, slides, swings, sandbox, and a clubhouse. In the economy of the 1950s, the entire project, including purchase of the land, grading and construction, cost $186,000. 'The more things change, the more they remain the same.' Over 100 years ago, Alphonse Karr (1808-1890) had it right. In 1989 the Recreation and Park Commission approved renovation plans for the 35-year old clubhouse and in 1995 a budget was added to the Capital Division's file. Nothing happened. 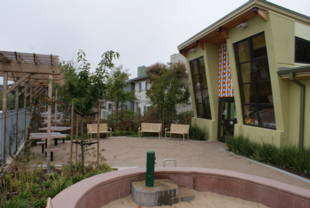 But now since Propositions A (Bond) and C (Open Space Fund) passed in 2000, almost every park has its place on the calendar and Junipero Serra Playground (JSP) is scheduled for renovation in this fiscal year which began July 2003. This time around, the Friends of JSP have built a corps of supporters with co-chairs Kathy Kaplan and Lisa Napoli leading the troops. Their own toddlers are in the mix of infants, preschoolers and children from surrounding schools -- Lakeshore, Commodore Sloat, Jose Ortega, Lowell, St. Stephens and Brandeis Hillel -- who visit the playground daily. And its deteriorated condition -- carcinogenic materials, some physical hazards, lack of ADA standards -- is a serious concern to the community. After repeated calls to Rec & Park's capital improvement division, Tony Leung was assigned as project director. John Thomas, landscape architect, Department of Public Works (DPW), is currently working on the children's play area, and architect Jorge Alfaro is conducting a 'needs assessment' of the playground/clubhouse that includes costs of renovation or replacement. Friends of JSP met in June and September with Leung, JSP director Madelyn Corder, and Neighborhood Parks Council's playground campaign director Linda Hunter to discuss renovation priorities and the possible involvement of the Playground Campaign. The campaign is a partnership between NPC and Rec & Park to reduce playground renovation costs and stretch capital improvement dollars. It fosters community involvement in every phase. NPC is presently negotiating a contract with Rec & Park to ensure that there is funding for the organizing phase of this project. In the meanwhile, Friends of JSP have surveyed park users and neighbors, and held community brainstorming about their renovation desires and priorities. Everything is in a holding pattern until the assessment (scheduled for November completion) is released. Then a steering committee -- Leung, the DPW architects, Madelyn Corder, NPC (assuming funding) and Friends of JSP will meet and move to the next step of the plan. Meanwhile on Stonecrest Drive, Directors Madelyn Corder and Glenn Havlan are engrossed in the fall recreation program for pre-school, ages 2.5-5 years; school-age, 6-12 years; and adult, 50 +. Kids get into games, music, painting, crafts, ceramics, gym and basketball. Parents can sign up for the latchkey program where space is still available. The 50+ Social Club meets to enjoy art, seasonal luncheons, day trips and van trips. From September to May, Glenn also runs the San Francisco Free Civic Theater Program, offered by Rec & Park. For park stages he produces and directs dramas cast with an ad hoc repertory company of volunteer thespians. 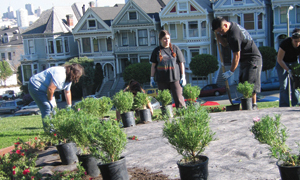 (Information: 415-337-4713; or http://www.sffct.org).